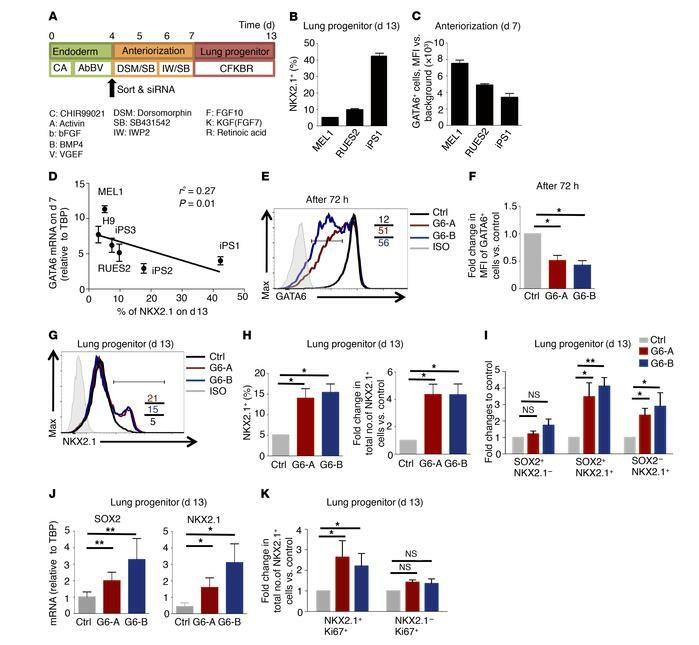 Low GATA6 expression during endoderm patterning enhances lung progenitor generation. (A) Schematic of the lung differentiation protocol. (B and C) The expression of NKX2.1+ in lung progenitors (B) and GATA6 at anteriorization (C) from 3 human PSC lines (n = 7). (D) Linear regression analysis of GATA6 on day 7 versus NKX2.1 on day 13 from 6 WT human cell lines. (E and F) Transfection of 2 siRNAs against GATA6 (G6-A and G6-B) or control scrambled siRNA (Ctrl) at anteriorization stage in MEL1 ESCs. GATA6 expression (E) and quantification (F) after siRNA treatment (n = 4). (G) The expression of NKX2.1 in cells treated with GATA6 siRNAs. (H) Average expression and absolute cell number of NKX2.1+ cells (n = 5). (I) Coexpression of indicated populations treated with GATA6 siRNAs (n = 5). (J) SOX2 and NKX2.1 expression of cells treated with GATA6 siRNAs (n = 5). (K) Coexpression of NKX2.1 and Ki67 in cells treated with GATA6 siRNAs (n = 5). Data indicate the mean ± SEM. *P < 0.05, **P < 0.01 by 2-tailed t test.